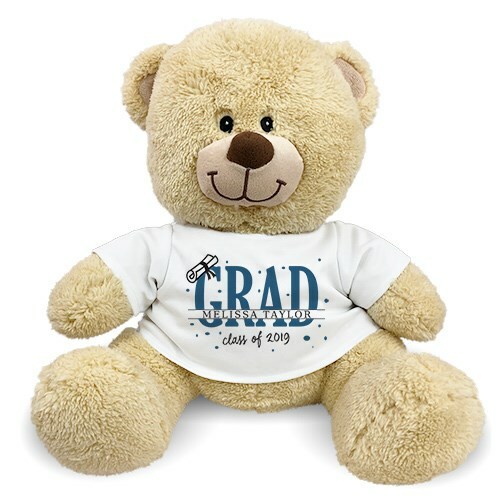 Celebrate a great accomplishment like finishing school with this great stuffed graduation teddy bear keepsake. This plush teddy bear wears a t-shirt personalized with any year and name! This Personalized Diploma Sherman Bear is wonderfully soft feel. He features contrasting tan fur on the inside of his ears and his snout. He's available in sizes 11”, 17" & 21" sitting, and makes a wonderful gift for any occasion. Free gift wrapping is included plus a personalized gift message, to create a thoughtful presentation. Additional Details Also check out personalized teddy bears for him and personalized teddy bear for baby!